This paper provides a high-level framework for leading transformative change that increases the probability of success by integrating leadership and culture into the process. It is based on decades of practical consulting experience incorporating integral models into solid consulting and change leadership frameworks. This material is intended for leaders exploring options to traditional frameworks, and also for consultants and integral students interested in supporting clients who are leading large, complex change initiatives. Accelerating change continues to impact every facet of business. To thrive long term, business leaders must make implementing change a core competency in order to capitalize on our changing world instead of merely trying to adapt to it. In attempts to stay abreast of rapid changes, continuous advancements in system efficiencies have been enabled by unprecedented rates of technology development. The ensuing race to keep pace with competitors and technology has proven deeply problematic: innovating functional efficiencies has become the singular focus of most corporate strategy at the expense of vision and cultural cohesion. Significant dissonance between purpose and day-to-day functioning has arisen as companies have focused their energies on functional training rather than developing sophisticated thinking, complex interaction capabilities, or comprehensive decision-making skills. Organizational strategy has essentially been reduced to improving functional processes, and technical competency has inappropriately become equivalent to strategic vision. This shallow version of strategy has not only driven market volatility, it has worked to marginalize new organizational strategies, particularly those emerging to address the flattening global economy. Companies are applying more technology innovation to resolve issues that were actually created by a myopic focus on innovating technology. The nature of these changes is becoming progressively more complex. Every moment of experience is influenced by the interaction between intention, action, culture and systems. All four of these basic dimensions are fundamental to every experience we have, and mutually shape them in all circumstances. Leaders must consider the four-dimensional view of reality and balance the situations they face in the most comprehensive way possible. Balancing the whole is critical to effectively transforming your organization. A multi-faceted approach provides a more complete, accurate view of events and situations than the traditional one, which favors analysis based primarily on a systems or process view, and excludes culture and leadership impact. Leaders often take the more traditional approach to changing organizations, overemphasizing systems change with little or no consideration of the culture or how their personal mindset and actions shape the change’s content and success. Our model, the Innovative Leadership Transformation model, provides a framework that enables leaders to create continuous alignment across the four dimensions. Companies clearly need innovation to successfully navigate both current and emerging economic landscapes – and most are not getting it. It’s relatively rare for transformation programs to deliver the results projected in an original business case. Simply put, companies attempting to traverse the economic landscape with incomplete tactics will not succeed. In addition to tactics, however, we must also look at the impact leadership has on the organization’s ability to successfully implement change. An inappropriately heavy focus on system performance and analytics often proves costly. Enhancing organizational capacity must go beyond increasing system functionality. More comprehensive approaches to leadership and organizational transformation must be seriously considered. If, in addition to developing better functional processes, one also begins to clarify strategic vision, grow leadership capacity, and build a cohesive company culture, greater and more sustainable success will be achieved. Of course, not every challenge requires a leader to change how he thinks about the business or himself as a leader to “solve” it, but many complex challenges do. One of the biggest challenges for today’s leader is developing the ability to identify which problems require complex solutions and which are merely technical in nature that can be solved using more traditional approaches. Developing complex solutions requires experimentation and often generates new discoveries. They can take a long time to implement and are not successfully implemented by edict. To succeed in developing complex solutions, leaders must fully understand the organization’s problems and challenges, their own leadership capabilities, and the barriers and resistance they will likely face. Complex challenges illuminate deeply held beliefs and force not only a change in how work is done, but also in the leaders, themselves, and in an organization’s values. What results is more than a process change or innovation translation: a complex solution also changes personal values, beliefs, behaviors and interactions. The most effective solutions to complex challenges are those that change the leader and the organization’s relationship to processes, values, behaviors and interactions. In other words, the change process works on the leader at the same time the leader works on the change. As the term suggests, “adaptive challenges” require leaders and employees to learn new ways of thinking about the work as much as new ways of doing the work. Adaptive challenges are often the most elusive, as they require that leaders change not only the organization, but take on the difficult process of looking at themselves as leaders and determining how they need to change in order to solve the challenge they face. “Adaptive change” and “transformation” will be used throughout this article to mean complex changes that require a solution involving change to the leader, the culture and the organizational systems. The Innovative Leadership Transformation model is based on synthesizing several change models into an integrated process a leader can use to guide him and his team when addressing adaptive challenges. It incorporates recent research from a broad range of thought leaders, the Innovative Leadership Development model, and a modified version of Kotter’s change model. Its key differentiator is that it puts leadership on equal footing with other change elements while also singling it out as “special.” This seeming contradiction exists because leader maturity has, to date, not been a focus of transformation efforts. Our Innovative Leadership Transformation model pays special attention to guiding leaders through their own change by using a just-in-time approach to leader development that enables them to undertake their organization’s transformation. Jim Collins, the bestselling author of Good to Great and Great by Choice, says leadership is critical to effectively move organizations to greatness. He uses terms like Level 5 Leader and 10x Leader to refer to the type of leadership required to successfully implement adaptive change. His books start with leadership as the foundation for effective transformation. Kotter’s concept of a dual operating system moving beyond hierarchy to a networked model of operation is addressed by our Innovative Leadership model. The concept of leading change starts with leadership, and yet in many organizations, the process of leading change often omits the idea that transforming leaders is part of the overall process. Leveraging the focus of key researchers and our own change implementation experience, we have focused on building innovative leadership as the foundation for implementing adaptive change. We define innovative leadership as the ability to influence by engaging equally across the four key dimensions: intention, behavior, culture and systems. A primary reason for transformation failure is that leaders focus primarily on the systems, rather than the larger context that includes themselves as leader and the organizational culture. 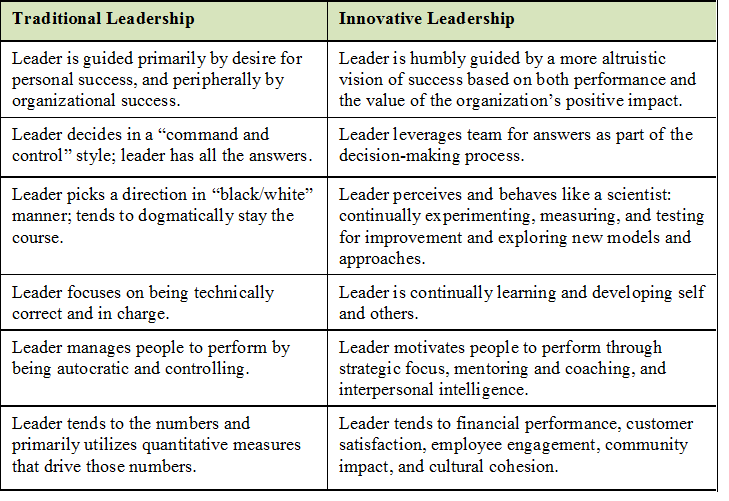 Because innovative leadership influences by engaging the four dimensions equally, innovative leaders are uniquely qualified to implement adaptive change with a much higher success rate. The Innovative Leadership Transformation model is based on a combination of approaches, and has eight steps that represent the high-level activities required to effectively transform an organization. Within each step, the leader takes action across the four key dimensions of intention, behavior, culture and systems. Again, this is a key differentiator: in traditional change efforts, the leader focuses on system change, with little to no systematic focus on the leader himself, or the culture. By expanding the focus to a more comprehensive solution, leaders drive more successful initiatives. Create a vision and sense of urgency – ensure key stakeholders understand the vision of the transformation, its guiding principles, and why the change is urgent and necessary. Along with defining the reason for the project, it is important for the leaders chartering it to clearly convey what they expect the organization to accomplish, who will accomplish it, and how success will be measured. The outcomes of this phase are that leaders and key stakeholders have a clear understanding of the foundation for the change that aligns the project with the overall organizational strategy, and a project charter that empowers a specific set of leaders and employees to embark on the change project. Recruit and build your team – identify who will be involved in the transition, and in which roles. This is a vote for who is, as well as who is not, part of the transformation or on its leadership team. It is critical to identify selection criteria that aligns with the complexities of your change. Some criteria to consider are: subject matter experience and skills, ability to create buy-in, perceived leadership and influence in the organization, behavioral qualities that will allow participants to function well as part of a team, and leadership maturity. It is important to address leadership issues early. There may be people on the leadership team who will impede or undermine the project’s success. They are often asked to join the team because they have critical knowledge and relationships, or are retained in roles that will not impact overall success. Make the difficult decisions before damage starts occurring. Though not easy actions to take, they are essential to managing both risk and engagement on high-cost/high-impact projects. Once selected, team members will engage in activities to learn how to work with one another effectively on a high-demand, high-stress project. Analyze situation and strengths – the combination of the vision and your understanding/ analysis of the current state will give you a solid foundation to determine the gaps between where you are and where you want to be. It is important to develop a firm understanding of the four key dimensions of your current situation to create a complete picture. 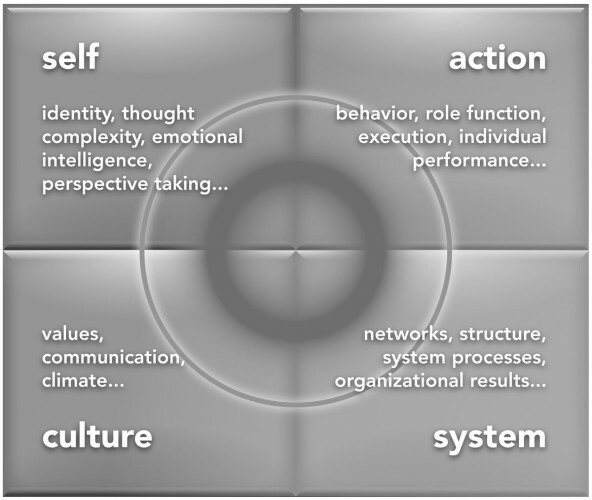 The four dimensions are leader intentions, behaviors, organizational culture and systems. This data will help you clarify what needs to change within the organization and what you need to change about yourself to successfully lead the change. Thoroughly assessing the situation will give you clear information about your current state and, in conjunction with your vision, help you confirm and refine the project’s scope. Plan the journey – create the initial plans that will drive the project forward. Plans establish the foundation for project performance and success. If they are not thorough, it will be easy to get off track and later realize that course correction is needed. One key tactic in implementing successful transformation is launching large-scale, collaborative planning efforts. This collaboration began in the assessment phase when you asked stakeholders at all levels for their input. It will be important to continue to look for opportunities to solicit input on the plan from all groups impacted by the change, but in a manner that is efficient. Just as your assessment looked at the four key domains, your will use the results of your assessment and gap analysis to create plans that account for gaps in each of the four areas. Communicate – communicating is broken into phases based on the goal you are trying to accomplish. Initially, you want people to be aware of what is happening. Next, you want them to understand why you are making the change and why they will benefit from it. Eventually, you will want them to believe in the change and take action (support the change). Different audiences will get information at different times throughout the project. Messages and timing must be designed to help people understand and respond appropriately. The project team, for example, will need to go from communication to acceptance quickly, because you want them to accept their roles on the team. End users of the system may not need to act until you invite them to a training class eighteen months after the project starts. You will want them to be aware something is happening, butd you want them to stay focused on their jobs until it is time for them to get involved. Implement and measure – use the plan you created in the planning phase to drive action. During this phase, it is imperative to ensure that your behaviors are aligned with the change you are trying to implement. People will listen to what you say and watch what you do. It is also important that you be actively involved in communicating, monitoring progress toward implementation through metrics, and delivering appropriate positive reinforcement for successes and consequences to groups that are not meeting their commitments. The project team benefits tremendously from a visible and supportive leader during this phase. Embed transformation – solidify the change to make it part of normal life rather than a special project. Some actions that can encourage the change to take root include: updating recruiting and onboarding processes, refining the promotion process to reward those who behave in accordance with the stated goals, and creating new stories that reinforce the new culture. To maintain momentum, it is critical to retain a sense of urgency while minimizing the sense of complacency that may come from early success. Beware that it is easy to stray from your goals if you declare success based on early results, especially when other projects tug at your time and attention. One helpful shift in thinking is to see the actions you are taking as a practice. You are practicing your disciplined business activities in the same fashion that a professional athlete practices a sport. Includes the leader in the change process, expecting the leader to innovate how he leads to keep pace with the challenges he is solving. During this era of increased complexity, accelerated need for change, and failed change initiatives, it is critical that organizations identify new models that address these challenges while concurrently maintaining efficient, effective operations in order to have to have a higher likelihood of successful, sustained change. Implementing substantial transformative change is the work of innovative leaders leading a team of skilled people to accomplish a goal that will become more finely tuned during the implementation process. Adding to the complexity, these projects are more successful when implemented outside the corporate hierarchy using networks of people and projects that are interdependent on one another. The purpose of this article is to give you, as an innovative leader, a high-level understanding of the change process and how to lead change – it is not intended to teach the nuts and bolts of managing a project or change effort as part of the project team. Maureen, the CEO of Metcalf & Associates, Inc., brings 30 years of business experience to support her clients’ leadership development and organizational transformation. She is recognized as an innovative, principled leader who demonstrates operational skills coupled with the ability to analyze, develop, and implement successful strategies for profitability, growth and sustainability. She combines intellectual rigor and discipline with an ability to translate theory into practice in each of her client engagements. Her solutions are practical and actionable. 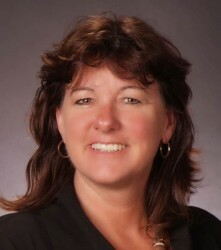 She designs and teaches MBA classes in Leadership and Organizational Transformation at Capital University and Global Leadership at The Ohio State University. She was also on the board of trustees for Urbana University. She hosts an international radio show focused on innovative leadership and organizational transformation. Maureen is the award winning Innovative Leadership book series. Carla is an innovative leader and strategic consultant who is recognized for delivering pivotal results under trying circumstances. The perspective she brings to business challenges combines 23 years of consulting, entrepreneurial and public company experience with an ability to connect with people in a way that draws them out and inspires their engagement. Her consulting work leverages Silicon Valley M&A experience as Director of Corporate Development, where she led global due diligence and integration teams. When not involved in acquisitions or divestitures, Carla led major initiatives for the CFO and other senior executives that brought fundamental change to the company, including restructuring a global Finance organization and bringing business agility to 3,200 employees worldwide. Heifetz and Laurie built on these initial findings in their June 2009 book, The Practice of Adaptive Leadership: Tools and Tactics for Changing Your Organization and the World. These include Kotter’s model in Leading Change, Heifitz and Laurie’s model from their paper “The Work of Leadership,” and Ken Wilber’s integral model. Maureen / Carla – Thank you for this work. I love how you have integrated the 4 quadrants into mainstream leadership work like HBR, McKinsey, Kotter, and Collins publications. As a recovering program manager(!) and internal / external consultant, I have personally experienced the affects of a lack of addressing the cultural, mindset, and behavior impacts in transformations. My current work has me working as an internal consultant to a large utility. Within that context, I can attest that the characteristics you highlight in this article are alive and well. I live and work in the San Francisco, CA area, and would welcome a opportunity to meet over a coffee or wine, if you are interested and in the area. Thanks for this article. I just noticed your comment. I live in Columbus, Ohio so coffee in person is tough but a cup of coffee and a call would be great. Please email me directly at maureen@metcalf-associates.com.